This is not a typical design narrative as I'm not a teacher, so the learning activity being modelled is a reflection of the design of a personal learning plan. It is a discussion of my own plans and actions for undertaking distance learning study on the OU MA Online and Distance Education. Prior to joining the MAODE, I had no distance learning experience. I also had no previous direct experience in the field of study therefore wanted a plan to structure my background reading, and to structure my study, note-taking, and research once the course began. How to manage and structure my pre-course study preparation – to gain some background knowledge on which to build. How to organise and create a useful personal resource from my study activity. Finding ways to build study into and around my normal and working life – use of materials and systems. Gain experience of TEL, new tech, and social tech apps. Choose software for organising notes, research and study materials. I chose the MS OneNote product. This is cloud-based – which allows for flexible working at various locations, and also is stable and backed-up. I have developed an organisation and formatting style that allows me to distinguish between course directions, quotes taken from sources, paraphrased text, my own notes and comments. Notes can be organised in a structure: Note-Books > Section-Groups > Sections > Pages etc. and the whole resource is searchable and easily navigable. I read the notes for a few of the modules prior to enrolment and purchased recommended texts and others that I noticed myself that seems interesting. I also use OneNote to record notes on books and articles read outside of direct links to the course work. I became interested in Blogs, Podcasts, and YouTube as information sources. I started a blog for writing practice and as preparation for course elements. I looked at social media apps such as Facebook etc. but cannot find a personal use for them that would justify any allocation of effort at present. As mentioned I use podcasts on academic writing, and also on subjects relating to the module content. These are excellent to fit flexibly into travel and other times. I also convert videos into audio format for listening to on an audio player (if the content does not suffer from the lack of video). The cloud-based nature of the OneNote tool allows me to work in multiple locations. As many TMA/EMA assessments are linked directly to course content the building-up of personalised notes, reflections, and additional content can become the perfect starting-point for getting underway with assessments. In this way I am motivated to fully participate in activities, reading, and deep reflection and development of understanding throughout the module – in the belief that it will save me time and get me started on assignments as they are begun. This plan, the structure and format has worked well for me. I felt as prepared as possible at the start of the course and have subsequently at each point in the module/course. This kind of study, rewording and categorisation helps me to develop understanding and construct meaning from the source topic material. The structuring also helps me to organise my thoughts and the materials, and to create a resource to help me to create assessment pieces. This method produces a digital and searchable store of reflections and notes, forming a connected view of the topic. I find this method essential to keep up with the pace of study and my work/study balance. It is like a digital enhancement to my memory, knowledge, and understanding of the topic, which is necessary to aid in the completion of TMA/EMAs. I do find that the method involves quite a bit of work. For instance by the end of week 4 of my current module, I had created over 28 thousand words of material in OneNote. If I had a background in the topic or worked in the field I might have developed a less onerous plan. However, these activities and the plan as a whole support the learning and assessment outcomes of the module – which are then evidenced in the production of activity postings and the TMA/EMAs, ... and the notes contribute to that output. 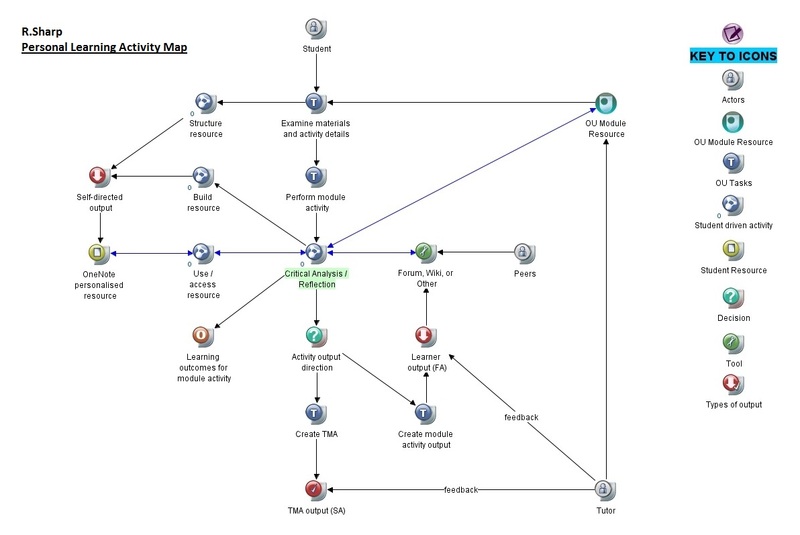 Here is a link to Personal Study Plan activity described above, visualised using the CompendiumLD software tool for designing learning activities. Here is a PPC (Pedagigical Patterns Collector) design for my personal learning plan. Output from designer was copied into Word including a screenshot and then converted to PDF. Thanks for sharing your compendium mindmap. I think it would help me with my own planning and find they can be very personal - at least this type. I am trialling freemind.org (also open source). After seeing a demo on Xmind, which can export the map and it's layers into Word and create a draft of your essay/TMA into chapters or headings. Sadly that feature is only in the paid version so I did a bit of searching and found Freemind which claims to do this free - must find time to try it properly! In working collaboratively would be very useful - I remember from H800 video that you can embed PDFs and notes behind the images keeping all the project paperwork in one file! However I didn't find the icons easy to read and still don't. Maybe once you get used to them??? Xmind let you create them as you go as pics or text labels. Not sure about freemind yet - reading the documentation looks very promising.